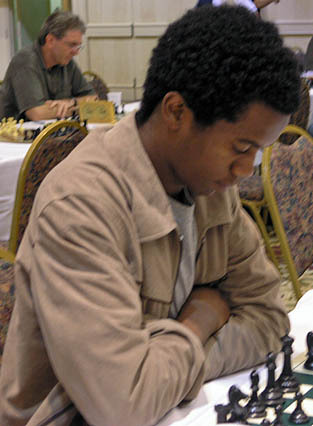 Farai Mandizha is a long way from his home in Zimbabwe, but over the past few years has made a presence in the U.S. chess scene. Over this time he has made an impression in his New York base and has now achieved the difficult task of earning the International Master (IM) title in the U.S. He earned his last norm at the Philadelphia Open just one week after an IM performance in the New York International. At the recently ended World Open, he continued his onslaught by scoring 7.5/9 in the under-2400 section and should vault well over 2400 to qualify for the title. What is so difficult about earning norms in the U.S. is that there are few opportunities. However there are a few new tournaments that will afford such a chance and Mandizha got norms in two of them. The New York International is only in its third year and the Philadelphia International has only been in existence for four years. The World Open and Foxwoods had been the only marquee tournaments offering the best norm opportunities. In addition, these tournaments are very strong which means that you have to be in top form. The Zimbabwean IM-elect has definitely been in form. Here is an assessment of Mandizha’s IM norm performances. IM-elect Manidizha has played very well in this stretch and perhaps he is now competition with fellow Zimbabwean IM Robert Gwaze on who will be the first Grandmaster of the country. Gwaze certainly has the raw talent and perhaps they will both reach the prestigious plateau. However, the issue of viable opportunities becomes the issue. Despite the fact that Mandizha could have opted to get the IM title in a singular African Championship, the three-norm system certainly gives a measure of how a player stands against the strongest competition. 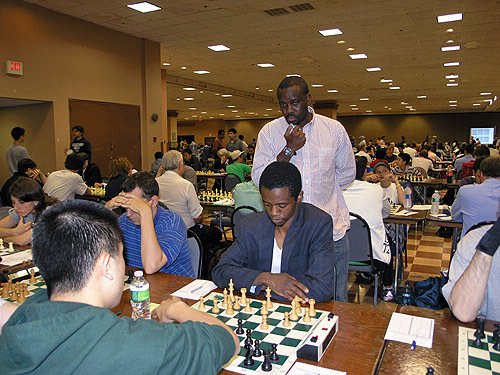 FM Victor Shen vs. IM-elect Farai Mandizha at 2010 World Open. Nigeria’s IM Oladapo Adu watching the action. Shen won the section with a remarkable 8/9. Mandizha scored 7½ (losing only to Shen) and Adu tied for 3rd-5th with 7. Photo by Daaim Shabazz. Congratulations and well-done for achieving the IM Title status. Most importantly I applaud the pace and form you are currently experiencing. It sure leads to the ultimate title in Chess my man! Suddenly Grandmaster Farai Mandizha looks doable! Daaim, thanks for your relentless hard-work of keeping all informed! I don’t know how you do it! Big Ups! I’m not 100% certain, but Farai may be the first African player to earn his International Master title using the rigorous three-norm system. Most others have gotten it through a 6/9 result in one zonal tournament or African Juniors. It is of course the longest way to do it, but the chances increase that he will be able to navigate the GM process. He certainly has been playing well and would not be surprised if he earned a GM norm before the summer is out. What’s the delay on his official IM title? The last time I talked to Farai he was waiting on a norm certificate. That was months ago. His federation should apply for the title and pay the fee, but I’m not sure what is happening. He may decide to apply on his own. How much is the fee? I’m sure Farai is not trying to be the next Larry Christiansen: GM w/o first having IM title. GM Samuel Shankland has recently put out some outrageously good videos on a recent game of his with IM Farai Mandizha. It’s a ‘no stone unturned’ analysis of this very complex battle in which Mandizha offered a threefold repetition draw with a certain rook move. It was a dynamic battle up to that point and at first Shankland thought his position was good enough not to consider accepting a threefold rep. But then upon further analysis he realized his position was only theoretically better and was extreeeeeeemely tricky. He embarked on it anyway.